An exclusive, patented active ingredient from Sothys Advanced Research. Hyaluronic acid booster. Action on the barrier function. Action on moisture flow. Pro-youthfulness action. Aqua(Water)-Glycerin-Hydrogenated polydecene-Zea mays (Corn) germ oil-Butyrospermum parkii (Shea) butter-Cetearyl alcohol-Octyldodecanol-Squalane-Tapioca starch-Xylitylglucoside-Cetul alcohol-Dimethicone-Glyceryl stearate- Hydroxyethyl urea-PEG-100 stearate-Anhydroxylitol-Cetearyl glucoside-Ammonium acryloyldimethyltaurate/VP copolymer-Boletus Aereus/Aestivalis/Edulis/Pinicola (Mushroom) extract-Olea europaea (Olive) oil unsaponifiables-Trehalose-Urea-Xylitol-Caprylyl glycol-Parfum (Fragrance)-Lecithin- Glycine soja (Soybean) oil unsaponifiables-Triticum vulgare (Wheat) germ oil unsaponifiables-Butylene glycol-Disodium EDTA-Serine-Tocopherol-Glycine soja (Soybean) oil-Pollen extract-Sodium styrene/acrylates copolymer-Chlorhexidine digluconate-Polymethylsilsesquioxane-Sorbic acid-Pentylene glycol-Algin-Glyceryl polyacrylate-Helianthus annuus (Sunflower) seed oil-Potassium sorbate-Xanthan gum-Sodium hyaluronate-Pullulan-Disodium phosphate-Potassium phosphate-Rosmarinus officinalis (Rosemary) leaf extract-Chlorphenesin-Sodium benzoate-Hexyl cinnamal. I have been using this product for at least 10 years and have wonderful skin results. Would never consider changing. 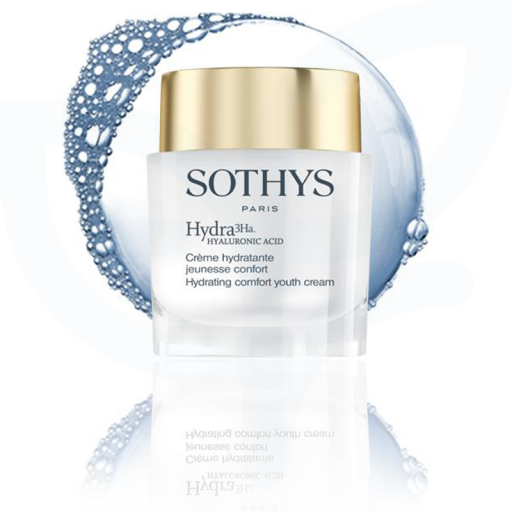 I rotate between a number of the Sothys day product offerings and have used the Hydra 3Ha range for two rotations. 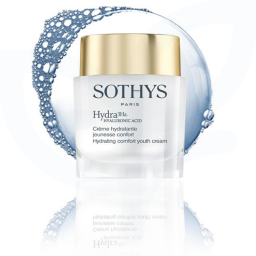 I had not previously used the Sothys hydrating range. This range is perfect for winter skin for extra hydration. The Hydrating cream is on the thicker side, so if you are hesitant about using heavier formulations, this day cream is not for you. For those who don't mind, I would still suggest restricting it to winter time if you like a lighter feel for the warmer months. The product is perfect under day makeup and helps skin stay hydrated, supple and smooth everyday. I couple with the serum for intensive results.